A Nuclear Threat to Heart Patients? U-M experts highlight shortage of radioactive stress test tracer. But in October, many such patients may not be able to get the best possible test due to a looming shortage of a crucial short-lived radioactive element. Called technetium-99m or Tc-99m, it’s one of the best ways to test for those blockages from outside the body. But one of the key sources for U.S. patients will stop producing it in October. And the situation may worsen, depending on what happens in the global nuclear realm. This means many heart patients could end up getting less-precise stress tests, or more invasive, riskier and more costly heart imaging instead, according to University of Michigan Medical School research recently published in JAMA Cardiology. Researchers led by heart imaging specialist Venkatesh Murthy, M.D., Ph.D., looked at data from 2 million Medicare participants who needed heart scans in the four years surrounding a six-month technetium shortage in 2010. The shortage happened when two Canadian plants responsible for much of the U.S. supply went offline. As hospitals tried to compensate for the lack, more patients had less-precise thallium-based scans that may have prompted doctors to send them for follow-up using a costly invasive heart-imaging procedure. In fact, the study finds, over 5,700 additional patients ended up having such procedures — called coronary angiography — during the shortage, exposing them to more risk and radiation. His study, conducted with U-M cardiologist Brahmajee Nallamothu, M.D., and team at the U-M Institute for Healthcare Policy and Innovation, looked at the type of stress test known as SPECT myocardial perfusion imaging, which can use Tc-99m or, less precisely, thallium-201. They also looked at the use of other heart-imaging techniques including PET (short for positron emission tomography), coronary angiography and stress echocardiography. During the 2010 shortage, the percentage of SPECT MPI scans done with Tc-99m dropped from 65 percent to 49 percent, with thallium being used as a substitute. Meanwhile, the rate of patients who went for an invasive coronary angiography within 90 days of having a SPECT MPI scan increased by nearly 10 percent. Though they can’t tell for sure from the data, the researchers say this suggests that patients who had the thallium scans were sent for further testing using the invasive angiography technique because the initial scan gave a false positive for serious blockage. The Canadian study showed a jump in the false positive rate when thallium scans were substituted for Tc-99m scans during the shortage. Murthy also notes that thallium is less expensive than Tc-99m even when it’s widely available. He fears that cost-conscious decisions about purchasing the tracers, as well as worries about a consistent supply, may be driving the overall decline in Tc-99m use that’s been seen since the 2010 shortage. But cost-benefit decisions, even as the price of Tc-99m rises when supply shrinks, should include the cost of follow-up tests after a false-positive thallium scan, he urges. 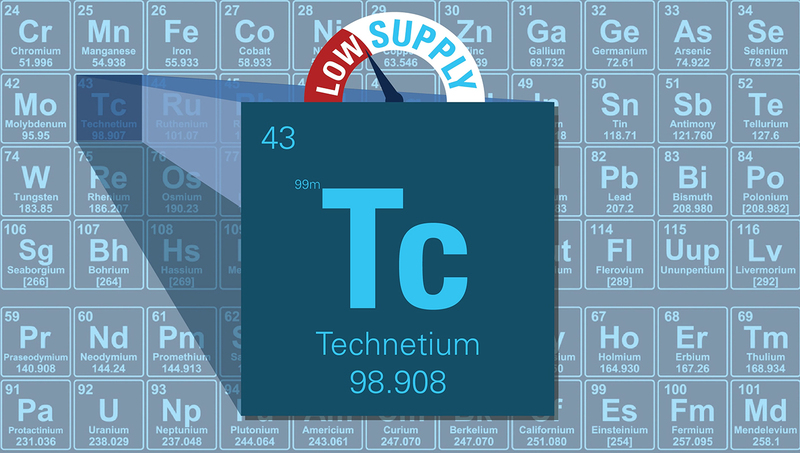 The shortage issue centers on the supply chain for Tc-99m’s “parent” element, molybdenum-99, or Mo-99. Right now, it can only be made by processing uranium in a nuclear reactor or particle accelerator. One of those reactors — at Chalk River in Ontario, Canada — will shut down in October. The U.S. and Russia are the only sources for the highly enriched uranium currently used in to make Mo-99 at sites in Canada and western Europe. But U.S. nuclear policy calls for an end to shipments outside the country in a few years. Nuclear arms control efforts aimed at reducing the proliferation of materials which could be used in making weapons are complicated by regular shipments of highly-enriched uranium around the world. Meanwhile, researchers are seeking alternatives for non-invasive heart imaging with other radioactive substances, or ways to make Mo-99 using low-enriched uranium. Murthy discloses that he owns stock in General Electric, Mallinckrodt and Cardinal Health, which are involved in radioactive isotope and cyclotron production. He has consulted for Bracco Diagnostics and Ionetix which are also involved in radioactive isotope production.